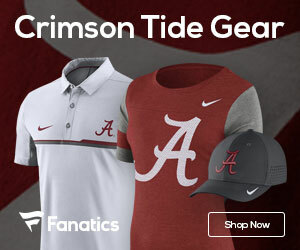 A-Day wrap-up: Not about stats, but about how the game is played | TideFans.com | By the Fans, For the Fans. By now, Saban knows the drill about the A-Day game and fans’ obsession with stats. If there was a way to laser-pen Bama fans’ knowledge of the postgame stat sheet, Saban would be slipping into a comfortable pair of dark sunglasses right now and flashing the entire Crimson Tide universe. Looking at the numbers, it would seem Mac Jones is threatening to take Jalen Hurts’ place as the Guy Who Pushes Tua Tagovailoa, but that’s not going to be the case in 2019. Alabama would appear to have no running game – also not the case, but we could have stood to see a little more production just to be on the safe side. No, what A-Day is about isn’t stats, it’s trying to subjectively judge players based on the way they “look” for one day rather than what the numbers say about them. It’s a test of meat on the hoof, a snapshot of not what someone did, but what they showed while doing it. It’s football, as imagined by David Lee Roth. Having said that, we’ll skip directly into our familiar Five-Point Breakdown for this game, but because there were two Alabamas on the field today – one Crimson, one White – we’ll expand from five to ten topics. And we’ll try to get it done before Saban shows up to a soundtrack that heavily samples Patrice Rushen. ILB concerns were top-of-mind coming into today. We feel a lot better after what we saw. It’s a safe bet few Alabama fans thought Josh McMillon would still be atop the depth chart at one of the inside linebacker slots at this point in the spring, because fifth-year seniors who have mostly ridden the bench for four years just aren’t supposed to do that. But McMillon put down probably the best performance of his Alabama career on Saturday, recording 5.5 tackles, including one for loss, and most importantly, did an effective job blanketing tight ends in pass coverage. McMillon certainly passes the eye test better than anyone else he’s competing with; he’s tall, thick and strong, but he hasn’t shown sufficient lateral quickness in the past and was a liability in coverage. We saw a different player Saturday, and more importantly, when McMillon makes contact with a ball carrier, they tend not to do much falling forward due to his strength. At this point, his closest competition is probably true freshman Shane Lee, a broad-shouldered brick of a teenager who flashed some ability in pass defense by recording an interception. Lee led all tacklers with 7 and did a nice job being part of a lot of plays. The other ILBs on the team – aside from Dylan Moses, who is a lock to start in the middle – are Brandon Ale Kaho, Markail Benton and Jaylen Moody, and they appeared, at least on Saturday, to still need seasoning. Moody had probably the best effort of the trio, making a nice read to pick off a pass and return it for a touchdown, but he didn’t record a tackle. Kaho is still visibly smaller and leaner than the others, and sometimes took bad angles. If the season started tomorrow, this would be a McMillon-Lee battle … and based on Saturday, that’s probably OK.
First-team defensive line has gotten deeper, and played with more discipline. D.J. Dale started over Phidarian Mathis at nosetackle, and was as disruptive as advertised against Bama’s guards and center in the early going. Both players ended up putting up a nice mix of penetration on passing downs and gap containment on running downs. Whatever else happens this fall, expect to see fewer gap busts on running plays if Saturday really meant anything. Others drawing raves included Antonio Alfano and Justin Eboigbe, both freshmen who came to camp looking like juniors in regard to build, and redshirt freshman Christian Barmore, another freshman with an impressive frame and strength at the point of attack. Raekwon Davis appeared to play more under control. A good way to cover up inexperience at ILB? Use a suddenly-deep DL to suffocate the offensive front. First-team secondary was on-point … emphasize “first.” Josh Jobe ended up doing Levi Wallace things, with the added benefit of being on scholarship. Jobe started at corner as Bama had to make up for Shyheim Carter being limited to black-jersey duty at Star, and he brought with him the same never-say-die attitude he left on the field in January after being pressed into duty against Clemson. This time, though, he added in another camp’s worth of experience and did a fantastic job harassing Crimson receivers with the tenacity of a panhandler outside the New Orleans train station. Trevon Diggs, Patrick Surtain II and Xavier McKinney also put up solid efforts. The second-team secondary, though, has much to work on. Scooby Carter and Nigel Knott both struggled against bigger receivers (more on that in a minute), while neither Carter nor Jalyn Armour-Davis were close enough to 100 percent to do much. Eddie Smith slyly baited Lia Tagovailoa into an interception, but also seemed a step off while guarding some routes. The takeaway here is that Bama needs to avoid both injuries and targeting flags. Arguably the best WR corps in the country just got deeper and better. Two names went flying to the top of the radar screen for a lot of opposing defenses: Tyrell Shavers and John Metchie. Shavers, at 6’6” and muscular, was mostly a dropped pass looking for a place to happen in 2018. Saturday, he caught everything thrown his way and made the Crimson team’s smaller cornerbacks suffer from the mismatch. Metchie won game MVP honors thanks to a show of strength and route acumen that allowed him to put up 5 catches for 133 yards. If you stopped right there, you’d have a true six-man rotation across three positions, when adding Shavers and Metchie to returning starters Jerry Jeudy, DeVonta Smith and Henry Ruggs III and top reserve Jaylen Waddle. Slade Bolden also got in on the act, making a tough catch on an inside slant and then throwing a 31-yard pass to tight end Cameron Latu on a lateral/pass combo play. Xavier Williams is coming off a redshirt year and gives Alabama even more depth. If Shavers, in particular, can continue to play this well in the fall, he adds a size mismatch for most defensive backfields. Add him to the ability of Alabama’s top four receivers, throw in Metchie for good measure, and it’s just unfair. Tight end is still largely unsettled, and James’ suspension further complicates things. Kedrick James is the most complete of the tight ends and the only one to really make you believe he can be a consistent blocker at the on-the-line Y position. Miller Forristall appears to be on the verge of a breakout year, but he’s most likely going to spend most of his time at H. The four-game suspension James is facing to begin the year, though, is going to make the early third of the year a bit slippery. Cameron Latu did a nice job as a receiver in his first action at tight end since moving over from outside linebacker, but he lacks the physical definition and size of James. Still, when he was in the game, he played mostly at Y, with Forristall sliding to H. Michael Parker and walk-on Giles Amos both played, but neither is on the James/Forristall level. Things were further complicated Saturday by Major Tennison being in concussion protocol. Expect Tennison to be the guy that replaces James early. We saw some things we liked (Latu’s hands, James’ potential, Forristall’s versatility), but not enough to completely quell the uneasiness surrounding this position. Kicking jobs will probably both go to new starters. Punter Mike Bernier is in the transfer portal, and it’s not a stretch to say his best opportunity to play in 2019 would be to make use of it. Bernier deserves a standing ovation for pulling Bama’s punting out of the ditch it was in mid-2018, but the fact Saturday was he appears to have been passed by two superior players. Skyler DeLong, whose job Bernier took starting with the Tennessee game last year, averaged 47.5 yards per kick and has banished the infamous hitch in his walk-up that torpedoed his 2018 season. Will Reichard, a kicker-punter combo player, is one of those guys you hear hit the ball as well as see. Reichard, in fact, appears in line to take Joseph Bulovas’ job as the primary placekicker. Bulovas missed two long attempts in this game, while Reichard hit one. Bulovas appeared to do a better job on kickoffs, though, and would seem likely to hold that job if for no other reason than to not expose Reichard to hits on kickoff coverage. Struggles in the running game may be a mirage, but one performance stood out. 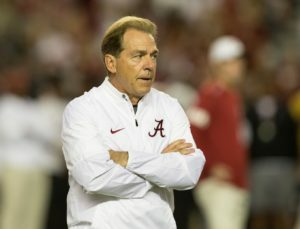 Saban mentioned in the postgame how Alabama ran as vanilla an offensive scheme as possible – someone must have forgotten to remove the Slade Bolden pass from the playbook – and vanilla would explain why Najee Harris and Brian Robinson Jr. spent four quarters beating their heads against a wall painted to look like the Alabama defensive line. Robinson showed probably more than Harris, but Robinson was going against the 2s, to be fair. Reserve Jerome Ford struggled to get going, then seemed to have worse traction issues than most once the rains came in the second half. That brings us to Chadarius Townsend, who spent 2018 shifting between receiver and safety. Townsend got 5 total touches and put up 37 yards, but what was most interesting about his effort was the difficulty the defense had in actually putting him on the ground. Townsend has good moves in the open field and it will be interesting to see whether Tide coaches try to build a package for him in the fall. If nothing else, he’ll push Ford for the changeup role in Alabama’s backfield. Defensive edge pressure has been turned up a notch. Credit new OLB coach Sal Sunseri with this if you want to – or just chalk it up to growing up – but Alabama’s young outside linebackers, led in this game by Chris Allen and Eyabi Anoma, were terrors. With Terrell Lewis sidelined as a precaution, Anoma did his best to make a statement that he deserves to be a starter in the fall. He had 2 pass breakups, a sack, another tackle for loss, and was credited with 1 QB hurry, although it appears he has a case against the game statistician on that one. Allen got 2 sacks, and although not credited with an official QB hurry, would probably sign a friend-of-the-court petition for Anoma in his case against the bookkeeper, if not join the suit as a co-plaintiff. Anfernee Jennings won the media award as the game’s top lineman, and although his day went by quieter, it was probably a deserved award. One has to believe Sunseri can also do big things for Lewis when he finally gets back up to speed. Also, a tip of the cap to walk-on William Cooper, who switched from Crimson to White before the game and got into the second-half playing rotation at OLB. QB depth chart appears to have some clear separation. The clearest of all appeared to be Lia Tagovailoa putting some distance between himself and Paul Tyson for the third-team role. The younger Tagovailoa really does look like a mirror-image of his brother, and basically makes this position almost worry-free for the next three years at minimum unless Bama gets hit with an extraordinary-sized injury bug. As for Mac Jones, he did what he had to do to stay the current backup to Tua Tagovailoa. Jones can get streaky at times and seems to do better when his snap count goes up, as it allows him to get into a rhythm. If Bama could bottle the confidence and touch he seemed to grasp midway through the second quarter through the end of the game, Jones could start for just about anyone in the league. But that’s the rub. As it is, he at least makes Lia Tagovailoa a likely redshirt unless big brother goes down for an extended period of time. Layne Hatcher, a late addition to the roster last year, barely got any work. Summary: The 2019 season will probably mark the season with the fewest questions at quarterback since at least A.J. McCarron’s senior year, if not Jay Barker’s. We’ll claim executive privilege and not make many statements right now about the OL. Again, this goes back to gameplanning, and with Saban saying the offenses were both hamstrung by the coaching staff, it’s hard to tell what we saw. In general, we feel comfortable with the following: The tackles seemed to struggle with the edge rush, there isn’t as much depth at tackle as people may have thought, there’s a surplus of inside personnel but fit is still an issue. That last point may be the real key, because Deonte Brown is probably suspended for four games to start the year, and Jedrick Wills wasn’t healthy for this game, so Bama had to scramble a bit. We feel four positions are fairly locked down for the fall: Alex Leatherwood at left tackle, Chris Owens at center, Matt Womack at right guard and Wills at right tackle. Left guard could go to one of three players, Emil Ekiyor, Evan Neal or Brown. Womack isn’t in the clear yet at right guard, either, but he was selected as a captain for this game, he’s a senior, he’s popular among the team and coaches, and no one likes to see a guy lose a job because of injury, which is what happened to him heading into 2018. Check back with us in August.